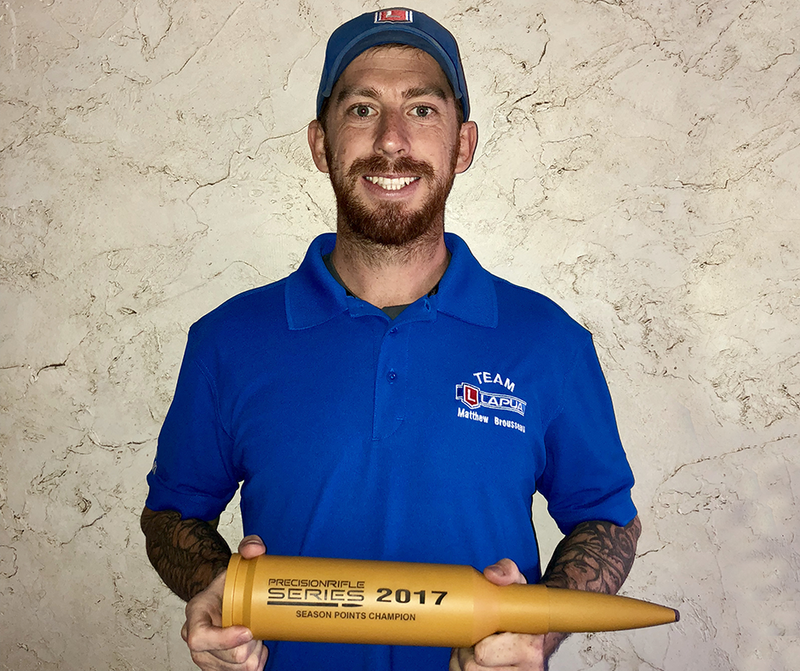 Lapua Team USA’s Matt Brousseau did an amazing job on the Precision Rifle Series in 2017. Finishing 2nd at the season finale just 1 point behind the winner, his overall points were enough to crown him the 2017 National PRS Champion! Lapua is proud to have Matt on our team. This is the wrap-up of season 2017 in Matt’s own words. The key to my success in season 2017 was centered around consistency. I turned all of my rifles into the same caliber and just really tried to master my data. Some shooters have “barricade match guns” and “field match guns” shooting different bullets different speeds trying to gain any advantage they can. I just took the same caliber to every match and tried to master it. To me, the most important qualities of a successful PRS shooter is mental toughness and resilience. Despite how much you train you just can’t win ’em all, not just matches but individual stages too. So if you have a bad stage, like we all do, having the ability to brush that off and keep going will separate you from the pack. If you spend too much time focusing on the negative your overall results will be negative too, stay positive. Picking one favorite match for season 2017 would be difficult, as all of my wins were special to me. None of them came easy and every one of them had another top ranked shooter right behind me. I’d even rank my 2nd place finish (1 point behind the winner) at the season finale up there just as special, as that’s where the best of the best all came to fight it out. If I had to pick just one, I’d have to choose the LRSE match in Kentucky. That was the last match I shot before going down for surgery and it was the best way possible to start my down time.